The ASA is supporting the Alzheimer’s Society’s #DoSomethingNew campaign for Dementia Awareness Week 2015. This highlights our shared belief that life doesn’t have to end when dementia begins and being diagnosed with the condition doesn’t mean you have to stop doing to things you love or trying new things. Dementia Awareness Week aims to raise awareness and highlight the efforts of carers who provide those living with the condition day-to-day support. The word dementia is used to describe symptoms which can include memory loss and difficulties with thinking, problem solving and language. The symptoms of dementia can occur due to diseases such as Alzheimer’s, or from multiple strokes or other causes of brain damage. In England, roughly 225,000 people develop dementia ever year, which equates to around one person every three minutes. There are currently around 670,000 people living with dementia which costs the UK economy over £26 billion per year. 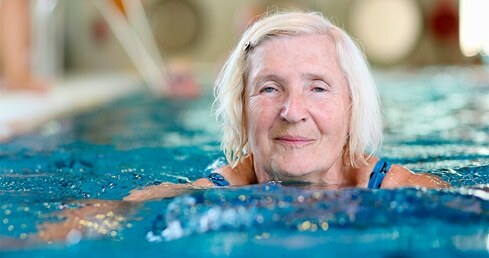 The ASA believes that swimming can be used to enhance the quality of life experienced by people with dementia because it offers a sense of mental well-being. While this cannot easily be measured, it is often anecdotally mentioned by thousands of regular swimmers. The relative weightlessness experienced while submersed in water reduces anxiety, clears the mind and encourages positivity and self-worth. We have developed the Dementia Friendly Swimming Project which aims to improve the experience of swimming for those living with dementia and their carers by improving facilities and removing barriers. This will not only give the positive effects a person experiences when in water, but also work to reduce loneliness through creating opportunities to socialise and make friends. Alzheimer’s Society operations manager for County Durham and Tees Valley, Samuel Palombella, said: “We’re delighted that people with dementia, their carers and their loved ones will benefit from this dementia-friendly swimming project, which we are sure will be a huge success. “This initiative will encourage people living with dementia to lead an active lifestyles which means they can continue to live well within their own communities and maintain independence. To find out more about the Dementia Friendly Swimming Project please click here. The Alzheimer’s Society have provided a whole range of resources including downloadable digital resources, information about ways in which you can get involved and support those living with dementia and other ways that you can support Dementia Awareness Week 2015. To access any of the information or resources provided by the Alzheimer’s Society, please click here.